• What are the Symptoms of Dysthymia? • What are the Types of Dysthymia? • What are the Causes and Risk Factors of Dysthymia? • What are the Complications seen with Dysthymia? 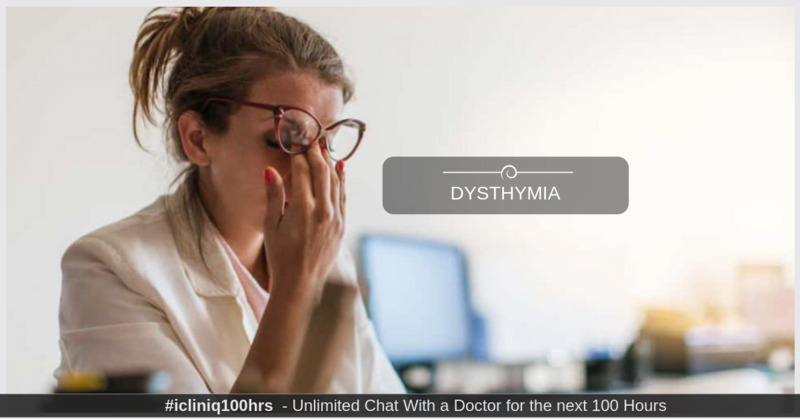 • How is Dysthymia Diagnosed? • What are the Treatment Options for Dysthymia? • When to See a Doctor? • How can Dysthymia be Prevented? • How is Psychotherapy useful in Treating Dysthymia? Dysthymia, otherwise called persistent depressive disorder (PDD), is a chronic form of depression. People suffering from this illness lose interest in normal daily activities, feel hopeless, lack productivity, and have low self-esteem. These feelings can also affect appetite and sleep. These symptoms can last for years and can interfere with the person’s relationships, work, school, and other daily routines. In this type of depression, the symptoms are less severe and last for a longer time. As it is a chronic condition, it is more difficult to cope with the symptoms. Treatment with talk therapy and medication has been found to be helpful for patients with dysthymia. Feeling fatigue or lack of energy. Feeling sad for no reason. Sudden increase or decrease in weight. Problems interacting with other students. What are the Types of Dysthymia? Early onset - before 21 years of age. Late onset - after 21 years of age. What are the Causes and Risk Factors of Dysthymia? Physical and chemical changes in the brain. Previous history of any mental illness. People who have low self-esteem or who are too dependent or pessimistic. Chronic illness like diabetes or heart problems. What are the Complications seen with Dysthymia? Can develop major depression, anxiety disorder, and mood swings. Decreased productivity in school and work. History - The doctor will talk to you about your symptoms in depth and will ask you questions to determine the cause of your depression. If it is related to some underlying health condition, then the doctor might do physical examinations. Lab tests - The doctor might order some blood test or other tests to rule out any medical condition that might be the cause of your depression. Psychological evaluation - Here, the doctor discusses your thoughts, feelings, and behavior in detail to come to a diagnosis. With the help of a questionnaire, the doctor might be able to come to the exact cause and psychological condition. Disturbed mood for almost every day or most of the day. If an adult has most of these symptoms for almost every day for two or more years, then they are suffering from dysthymia. For children, this diagnosis is made if the child is irritable and moody for at least a year. What are the Treatment Options for Dysthymia? Selective serotonin reuptake inhibitors (SSRIs) like Fluoxetine and Sertraline. Tricyclic antidepressants (TCAs) like Amitriptyline and Amoxapine. Serotonin and norepinephrine reuptake inhibitors (SNRIs) like Desvenlafaxine and Duloxetine. Psychotherapy or talk therapy is a way to deal with mental health problems by talking to a mental health professional. Cognitive behavioral therapy, which is a type of psychotherapy is found to be useful in treating dysthymia. Regular exercise for at least 30 minutes. Consume a diet rich in fruits and vegetables. St.John’s wort and fish oil are said to treat depression. Practice relaxation techniques like yoga and meditation. Maintain a journal about your daily activities. If you notice these symptoms almost every day, then it is best you consult a psychiatrist, as it can be a sign of dysthymia. As the symptoms occur for many years, you might feel that it is a part of normal life, but it can cause serious complications. Never ignore the signs and symptoms and get help immediately before it gets worse. How can Dysthymia be Prevented? Manage stress and anxiety to boost your self-confidence. In times of crisis, reach out to your family and friends. If you notice signs of depression, get help immediately before it worsens. Spend time outdoors and take out time to do things you like. Exercise regularly and eat healthily. How is Psychotherapy useful in Treating Dysthymia? It helps you adjust to your current situation. It helps to identify behaviors that contribute and aggravate your depression. It helps replace negative behaviors with healthy and positive thoughts. It helps build strong relationships with others. It helps control your symptoms thus improving the quality of life. Dysthymia is a chronic disorder and takes time to recover, so do not stop the medications and treatment half-way as there are high chances of relapse. If you notice signs and symptoms of depression and feel shy to consult a psychiatrist in-person, you can try online consultation with the help of online healthcare platforms. Do you have a question on Mental Health Problems or Anxiety?